You might feel that life is moving too fast, or you’re just too busy. But you were created to live fully in the moment, to use and grow your talents and gifts by connecting with and serving others who are less fortunate. We invite you to join with our Church Partners and diverse Volunteer teams who are working together to transform the lives of the economically trapped men and women through an innovative, faith-based training course. The course is just the beginning of a life-changing series of opportunities for them. And it’s a unique opportunity for talented people like you to integrate faith and work to personally impact families, and even change the course of future generations, right here in our community. 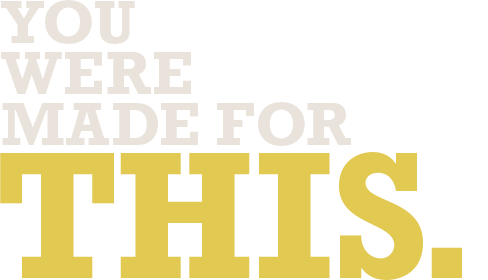 This is what you were made for. Across Florida, 46% of households struggle to afford the basic necessities of housing, childcare, food, healthcare and transportation. About two-thirds of these are the chronically underemployed families . * The Jobs Partnership provides a proven solution built on the Biblical truth that all people are created and designed by God to work, to be fruitful and to have purpose in their lives. We work together with our Church Partners to provide an innovative, no-cost training course for these men and women, called LifeWorks. LifeWorks is like a boot-camp for life and work, with practical, Biblical teaching that transforms the head and heart. The 12-week course meets for one evening per week, twice per year at regional training sites around Central Florida. The first night of class, Participants are paired with volunteer Coaches, who serve as their mentor and advocate, helping them develop a Career Pathway and restoring hope in the process. 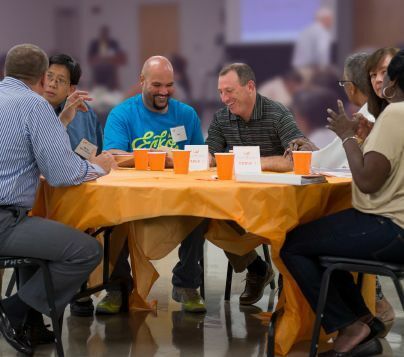 Throughout the course, Participants have numerous opportunities to engage with our Community Resource Partners, Educational Partners, Employer Partners and Church Partners. And that’s just the beginning. After Graduation, The Jobs Partnership team provides recommendations and referrals to Partners as the Participants take action on their customized Career Plan. The goal is to equip them, empower them, and launch them into a career-path opportunity that will lead to a family-sustaining wage as they continue the way forward….The Way Up. We provide everything needed for our Church Partners to promote, plan and run a LifeWorks Training course with the ongoing guidance and support of our team at The Jobs Partnership. In other words, the course is a ministry of local churches working together, using the structure, resources and tools provided by The Jobs Partnership. Most Church Partners choose to collaborate together in providing the class at an agreed-upon Training Site. Each Church Partner can choose to play the role or roles that best suit Their capabilities and strengths. When you Volunteer for The Jobs Partnership, you’re fulfilling what you were created to do: to serve alongside others, care for people, and share your gifts with the community. Commitment: 1 Evening per week for 12 weeks – Tuesday or Thursday Evening from 6:00pm – 9:00pm, plus one day of orientation. Coaches are the ‘lifeblood’ of the LifeWorks Training, personally encouraging, mentoring and guiding the Participants to pursue the job or career they were made for. If you want a more fulfilling volunteer experience and you are passionate about helping someone with career/personal development, consider serving as a Coach. Requirements include excellent interpersonal skills, small group facilitation, and support of the program’s Biblically-based content. Volunteers assist during 3 signature events conducted throughout the LifeWorks course: Resource Fair, Career Fair and the Graduation. For these events we need your assistance to serve as Greeters, Registration or Directional Parking. Commitment: Weeks 3 through 12: Tuesday and/or Thursday Evening from 6:30pm– 8:30 pm. Do you have a passion for teaching? Our Instructors are experienced teachers and trainers that delivers Biblical soft-skills and career planning content in the LifeWorks class, using our Instructor Guides for each module. If you are a pastor, business leader, HR/Training professional or similar, this could be the right role for you. Share your experience as an HR Professional, Hiring or Business Manager by conducting practice interview sessions with our candidates. Help calm their fears by giving them the opportunity to practice their interviewing skills and provide objective feedback to prepare them for a job search. Do you know what it takes to look sharp? Suited for Success Volunteers with our Church Partners serve as greeters and personal shoppers, outfitting the men enrolled in LifeWorks with interview attire, in preparation for job interviews. Do you love to get a specific project done? Our Special Projects Volunteers work on specific administrative functions at the JP office, including phone calls, assembling materials, data entry and event preparation. Do you love to serve with a team? Our Board Committee Members are industry leaders and content experts who serve on one of several committees chaired by a Jobs Partnership Board Member. For hearts to change, for lives to change, the supernatural must take place. The Prayer Support Team offers critical prayer covering for the Jobs Partnership Board, Staff, Volunteers, Participants, Partners and Donors. Time Commitment is flexible. All of our classroom Volunteers complete a one-day training session and enjoy ongoing education, training and mentorship by our Leadership Team. All other Volunteers receive hands-on training or instruction. The following downloadable resources are here for you to view and share with your church, family and friends. Also visit our News section for the latest news, events and stories.